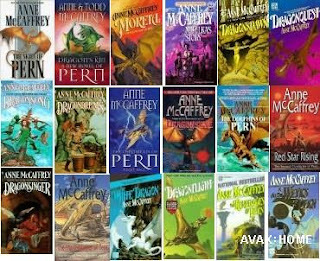 Anne McCaffrey died in her home Nov. 21, 2011. I am unexpectedly saddened by the death of a lovely lady I never met. Yet she touched my life in such a way that it should come to no surprise that started crying when I heard the news of her death. I am sure there are many others feeling the same way. I read her books when I was young, and actually have never stopped. They were there for me when I needed to escape to a world where Dragons were real and bad things did happen, but the strong survived. 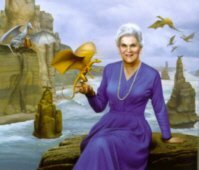 Unicorns lived, talking ships and psychics and other people with unique powers all came to life in her books. They gave me a place to hide in when I needed it and an example of strength when I needed that. Maybe part of it is that her books are really the only connection my father and I had. We both loved her writing, and the only gifts he gave me I have treasured are hard covers of her work. My favorite books were the Harper series. I have read them so many times the books are falling apart. There is just something about her writing that brings the books to life, make them seem real. It is too bad that she did not live long enough to see her books come to life in the movies. I look forward to seeing the first movie based on her Dragonriders in 2012. I hope the movie is as good as her books, and honors her writing. She will be missed by many, even those of us who never met her, but enjoyed her writing.